Perfect for a fun evening in the yard, your next camp out, or a night on the beach! This glow-in-the-dark frisbee is sure to provide hours of fun for the entire family! It makes the perfect gift, too! 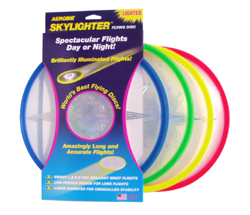 The Skylighter flying disc has a rubber rim that provides a performance grip for strong throws and a soft edge to catch. Available in yellow, red, blue, and green. This giveaway will end December 19th at Midnight EST. 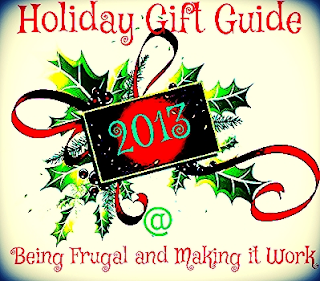 Disclaimer: The Being Frugal and Making it Work family received a complimentary Aerobie Skylighter Flying Disc for the purpose of writing a review and hosting a giveaway. Regardless, I only recommend products or services I would use personally and/or believe will be a good fit for my readers. The views and opinions expressed on this blog are based purely by our own experiences. No monetary compensation was received. Results may vary. I think my grandkids would love the Skylighter Disc. In fact I know they would love any of them! I'd love to win it for my grandkids. I know they'd have a ball playing with it and might even share!! What great products they have to choose from! I'd also like to give my grandson the Aerobie® Football Rocket Football! I'd like to win this for my grandson so he can have fun throwing it back and forth with his dad in the backyard! The other Aerobie toy I would love to give as a gift this holiday season would probably be to give my youngest son the Aerobie football because I've already given him an Orbiter Boomerang and a Superdisc. I would like to win this so I can give it to my youngest son. I like how different it is since it has lights and can be used in the dark. I would like the Megatop spinning top! Rocket Football. It looks like it would be tons of fun. I would love to win this for my kiddos. I think they would have a blast with it! I'd love to get the Megatop Spinning Top to my nephew for Christmas! I really think he'd like it! Oh I would also love the Orbiter™ Boomerang for Carter! We would also have alot of fun with that! I would choose the rocket football. I would give the flying discs to my children. I can see them playing with them for hours in the backyard and when we go camping. OH I would love to give this to my son for him and my grandson! OH they would have so much fun with it! So neat! Another product from Aerobie I would like to give as a gift this holiday season would be the Aerobie® Dogobie™ Disc. This would be for our dog who, I think, would enjoy it. They have some really cool stuff! Some of my favorites are the Aerobie® Football and the Aerobie® AeroPress® Coffee & Espresso Maker. I hope i win keeping my fingers crossed! Thanks for the awesome giveaway! I would love to win this for my son because he likes interesting things! Thanks again!